Deck stain does a lot. There are multiple challenges a stain must overcome in order to last. Quality formulas 1) resist abrasion, 2) don’t fade when exposed to UV light, and 3) hold up to heat, cold, wind, and water. Exterior finishes fail for two primary reasons: UV light and water. In addition to fading the finish, UV light can actually destroy many of the protective features of a finish. Water, whether from snow, rain, mist, or dew, can seep under the finish, causing the wood to warp, swell, splinter or crack. Extreme heat and cold contribute to the problem. As the wood expands and contracts with temperature changes, so does the finish. Sometimes tiny fissures appear. The same thing happens when the finish is abraded through normal activities. Cracks in the finish or wear allows water to seep in and cause damage. It’s true that extensive preparation, appropriate application techniques, and diligent maintenance contribute to a beautiful and long-lasting finish. But selecting quality products is important, too. Here are the things you need to consider when you are choosing your deck stain. Your first line of defense against UV damage is a densely pigmented stain. 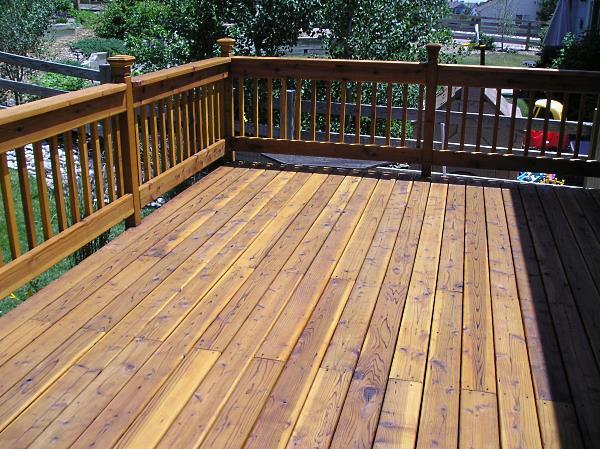 There are four types of formulas: transparent stains, semi-transparent stains, semi-solid stains, and solid deck stains. All other factors being equal, the more opaque a stain is, the better it will hold up. 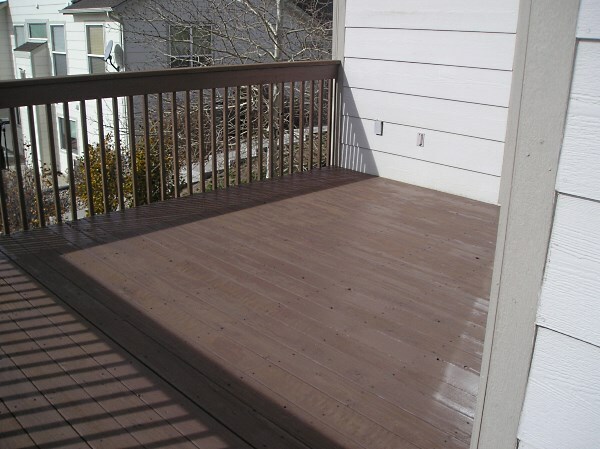 Transparent deck stains contain the least pigment. They allow the grain and texture of the wood to remain visible. From a maintenance standpoint, transparent stains are the least desirable option because they require yearly refinishing. Color options are also fairly limited. Semi-transparent stains are a step up. Although they allow the grain and texture to show through, they darken the wood more than transparent stains do. You can expect a finish similar to those achieved with wiping stain. A single coat lasts about two years; two coats will extend your stain’s lifespan, but not by much. Semi-solid deck stains are currently available from just a few manufacturers, Cabot Stains being one of them. Crowder Painting prefers semi-solid deck stains to other types. These stains are pigmented densely enough to last two to three years under normal conditions. A single coat will allow some texture and grain to show through, while a second coat will produce an opaque finish similar to those produced by solid color stains. Solid color deck stains have an opaque, paint-like finish. Flat and satin options are available, depending on the manufacturer. There are many colors to choose from, and you can even have custom colors mixed. They are not the same as paint, though. These formulas are designed to penetrate the wood, not just rest on the surface. Because so many attractive stains are available, it can be hard to choose your favorite color. Stain can help you lend cheap softwoods the appearance (though not the durability) of expensive exotic hardwoods. Use earth tones for the most natural effect, and avoid red-based colors. Red oxidizes and fades faster than any other hue. 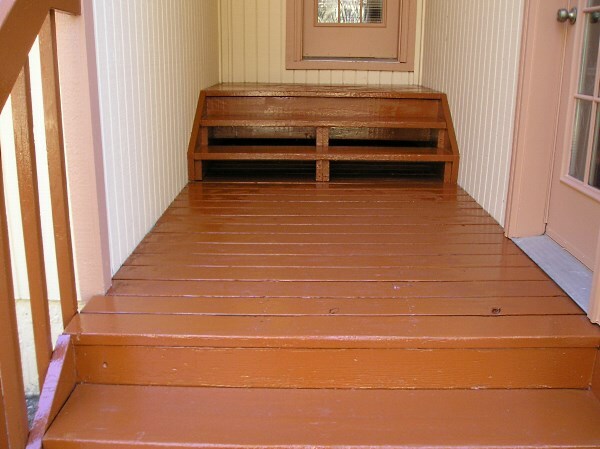 Consider using two different colors for your deck: one for the floorboards and a complimentary color for the railing. This produces a nice, decorative effect. This also allows you to restain the different parts as needed, without having to redo the whole deck just to keep the color consistent. The floorboards always wear faster than railings do. The decision of whether to use a water based or oil based stain is an important one, because these two types of stain perform very differently. Water based stains are much easier to clean up and release fewer VOCs. If your main concern is using an environmentally friendly product, or if you are extremely sensitive to chemicals, consider using a water-based stain. Just be aware that water-based stains usually need to be redone more frequently (every year or two). They are also more likely to crack and peel as they don’t penetrate the wood as deeply as oil based stains. Water based stains should be applied with a nylon brush. Oil based stains are smelly and need to be cleaned up with solvents. They should be applied with a natural bristle brush; synthetic brushes will deteriorate quickly because of the solvents in the stain. All oil based stains release some VOCs, although new versions are less dangerous to the environment than the old formulas. Health concerns associated with off-gassing are typically not a problem with decks, because the process takes place outdoors in the open air. 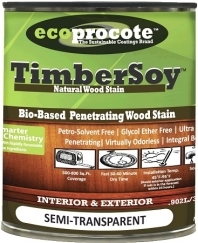 Oil based stains penetrate deeper into the wood and are less likely to crack and peel. This is primarily because all wood contains resins which are soluble when exposed to oil-based formulas. After all turpentine is a pine resin that was used for years as a solvent in paint formulas. Oil-based stains also last longer, typically 2-4 years. They tend to require less prep work before a new finish can be applied, so overall, they are lower maintenance than water-based stains. Crowder Painting almost always uses oil based stains to refinish decks.